Held back by the property qualifications needed to vote and stand as candidates in a range of local elections, female activists and feminists nonetheless formed local pressure groups to make their voices heard. When the property qualification was removed in the 1890s, they staked their claim to a formal engagement in public life, and by the early 20th century there were over 1000 female poor law Guardians. This book offers a reappraisal of the role of women in the politics and practice of welfare in late Victorian and early Edwardian England. Focusing on the Lancashire mill town of Bolton, it traces the emergence of a core of female social and political activists from the 1860s and analyses their achievements as they rose from the humble origins of a workhouse visiting committee to become pivotal players in the formulation and implementation of local welfare policy after 1894. Using a unique working diary written by the activist and female poor law Guardian Mary Haslam, the book portrays these Bolton women as sophisticated political operators. The author challenges established notions that women involved in local welfare administration were resented and achieved little, showing their importance in the process by which Bolton Poor Law Union moved from being one of the most backward and obstructive to one of the most progressive and dynamic in the country, adopting best practice from Britain and overseas and revolutionising the material and psychological fabric of the poor law. A fascinating and provocative book. Steven King has an established reputation in the history of social welfare; yet, he acknowledges that his discovery in 1994 of the manuscript diary of Mary Haslam led him to less familiar territory. Born in 1851, Haslam was a philanthropist, suffragist, and a Poor Law Guardian who lived and worked in Bolton, Lancashire. As a middle-class woman with a supportive family network, she was able to participate in local politics and Poor Law administration at a time when this was the principal form of state welfare. King, inspired by Haslam’s political life, attempts to fuse the history of welfare with the history of women’s activism, aiming to rewrite both in the process … A very attractive volume, which has something to offer all those interested in women’s lives in the Victorian and Edwardian periods. This is an interesting local and biographical study…King provides a vivid and valuable picture of philanthropy and public service among middle-class men and women in one town, and rightly comments that if we are fully to understand activities so important to late Victorian and Edwardian society and politics we need many more such studies, which for this period are all too few. 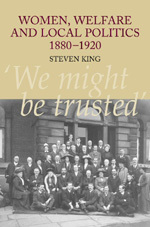 In this examination of the life and papers of Mary Haslam, poor law guardian and leader of the women’s movement in Bolton, Steven King sets out to elucidate a number of contentious debates over the influence of women on poor law policy and the development of feminism at the local level. In this as in so many areas of British social history, far more is known about national figures (usually based in London) than about local leaders. What makes Mary Haslam so valuable is not only her long service as a poor law guardian in the manufacturing city of Bolton, but the detailed working diary she kept during those years, which is reproduced in this volume. We can know precisely what Mary Haslam did and why she did it, from the time she became a member of the Bolton Ladies Workhouse Visiting Committee in 1893, through her election to the Board of Guardians, to the early months of 1905. To illustrate Haslam’s activities and the principles behind them, King also makes effective use of her travel diaries and her papers on the campaign for women’s suffrage in Britain. Hers was not only an interesting but also a well-documented life. ... To a reader interested in the poor law, therefore, the book has much to offer in the way of details of administration on a local level … but the principal function of poor law administration in this study is as a pathway to involvement in local politics and the feminist movement. To the study of these issues, the book is certainly a valuable contribution. At the beginning of the twentieth century, there were over 1000 women serving as Poor Law Guardians. Among them was Mary Haslam (1851–1922) of Bolton, a middle-class philanthropist, who came from one prominent local family and married into another, and who was the leading figure in the women’s movement in the town during this period. Haslam kept a working diary of her activities on the Bolton Ladies Workhouse Visiting Committee and as a Poor Law Guardian, and it is this unique source that underpins King’s study of the role of women in welfare and local politics between 1880 and 1920. The second part of the book reproduces this diary (covering the period 1893 to 1905), together with several other sources relating to Haslam: brief autobiographical notes, her diary of a family holiday to Ireland (which included a fact-finding visit to the local workhouse), and her history of the local women’s suffrage campaign in which she played a central role as founder of the Bolton Women’s Suffrage Association. She also served as president of its successor, the Bolton Women Citizens’ Association, and the source material concludes with its tribute to her as ‘a leader of great personality, high courage, and lofty ideals’ (273). ... King’s aim is to use his material on Bolton to tackle three interconnected themes: the workings of the Poor Law in the late Victorian and Edwardian period; the impact of female guardians such as Haslam on the Poor Law’s operation; and the broader development of the women’s movement in the late nineteenth century, thinking in particular about ‘the relationship between feminism and poor law work in the individual and collective feminist journey’ (4). These themes are linked together in King’s assertion that, contrary to interpretations that have seen female guardians as marginalized, resented by male colleagues and achieving little, women — in Bolton at least — made a substantive difference to the implementation of the Poor Law. ... As King himself notes, further local studies are necessary to establish how representative these experiences were, and he suggests at least 12 other women in Lancashire alone for whom similar studies could be undertaken. His engaging and thought-provoking survey of Bolton clearly shows the value of such work. This is an excellent and innovative book. It reproduces for the very first time the working diary of a female poor law guardian and offers a complex and comprehensive rethinking of the role of women in late nineteenth and early twentieth century local government. King concludes that women like Haslam were more typical of those who ran for election to local bodies as the municipal franchise changed to include women electors who formed as many as a quarter of all local voters; women like her were instrumental in the provincial suffrage organizations such as those that sprang up in Bolton as direct inheritors of poor law reform activism. Haslam’s feminism inhered in this course of action, although she and many of her fellow women participants in Bolton’s political community were opponents of militant suffragism. Haslam was an enlightened Liberal Party supporter who often refrained from partisan rhetoric in tactical bids to wage cross-party policy efforts, assisted by women Conservatives and ultimately mingling with women socialist and trade union advocates of the Labour Party and its left offshoot, the Independent Labour Party. In King’s estimation, Haslam can legitimately be cast as a feminist and a social reformer who was unlike her metropolitan counterparts, both more familiar and more ubiquitous as a type than much feminist historiography allows, even in her loyalty to her tirelessly supportive spouse. Haslam’s disciplined and rigorous work routine demonstrated compassion and steadfastness; her care for her poorer neighbors is apparent – driven by conscience, attentiveness to detail, and political savvy.